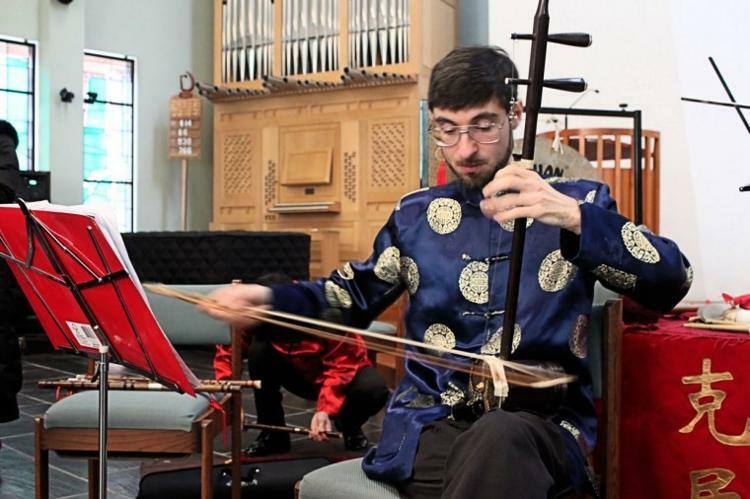 Director, Cleveland Chinese Music Ensemble | Long Island-native David Badagnani was introduced to Chinese musical instruments while studying classical music at Florida State University, where he majored in oboe performance. Over time Badagnani became skilled in the sheng, a 17-pipe mouth organ, an ancestor of the harmonica and the accordion, used for both melody and accompaniment. David received his master’s degree and Ph.D. in ethnomusicology at Kent State University. He is a founding member of the Cleveland Chinese Music Ensemble, which consists of musicians who play an assortment of Chinese instruments including the bamboo flute, Chinese lute (pipa), Chinese fiddle, Chinese zither, and Chinese percussion. The group’s first gig was in 2008; they played at the opening of The University of Akron’s Confucius Institute at E.J. Thomas Hall. The ensemble has performed at other venues since then, including international festivals and Chinese New Year celebrations. David will teach MUHI 310: Music Cultures of the World in Spring 2019.